Has it really been a year since I last took part in the One Room Challenge decorating event? Time really does fly! This time, I’m doing a bedroom makeover in my younger daughter’s room which I’ve been thinking about doing for months now. This challenge is just what I need to get myself into gear and get it done. Here is what I’m starting with. I painted the walls a dark eggplant color years ago. Although I always prefer light and bright rooms, I wanted to try out a dramatic paint color. We all loved this dramatic color for a long time. Eventually though, it just started to feel very heavy and dark. Time for a change. I was working with what I had in this room back then, so the floor plan was not working. When my daughter was little, we had her bed pushed up against the wall to allow for play space. When she was a bit older, I changed it around, trying to make the tall dresser work on the long wall and squeeze a desk in there too. I hung a gallery wall to surround the small TV. It really wasn’t functional or pretty. But I will say I did a great job painting this room, look at that perfect paint line! The dresser above has already been removed because it broke. The new plan will not have a dresser at all to allow for putting a larger desk on that wall instead. For clothing storage, I’m going to add two 3-drawer chests I picked up at Ikea, (I’ve already made them over) and a storage bench at the end of the bed. Those three pieces should make up for the loss of dresser. The TV will also be removed, my daughter is okay with that. I think we are raising a Netflix generation. 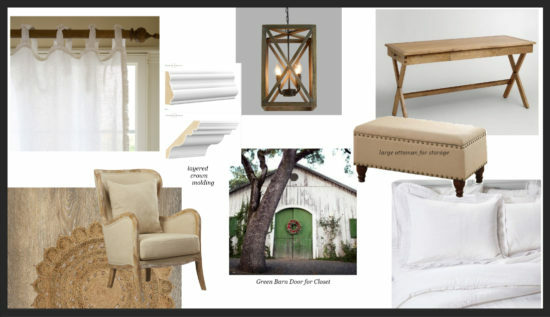 As for the design, I’m planning a very light and bright color scheme with rustic farmhouse accents. My daughter’s favorite color is green, so I might to add a pop of green in the way of a sliding barn door in place of her existing bi-fold closet doors. Here is my idea board for the space so far. I’ve been coveting that desk from World Market* forever. I had visited family in Alabama years ago where I visited a World Market store for the first time, long before we had any stores here in NJ. That is when I first saw that desk, and it will be the first thing I buy for this new space. My daughter is now a freshman in college (she lives home & commutes) so a comfortable study space is essential. The gorgeous chair shown has been on my wish list for almost as long as the desk, but I’m not sure if that will make it in the budget. My to-do list is long for this bedroom makeover and I’m hoping six weeks is enough time to get it done! Besides painting the walls, I plan to remove the carpeting and install new wood flooring. For architectural detail I will add layered crown molding. We are going to build our own sliding barn door to save some money. Basically the only thing that you see in these before photos that will remain is the mattress and boxspring. Here is the (long) to-do list. Luckily, I did get a little head start with painting the walls, I have yet to snap a few pictures of that. I am really unsure of what I am going to do as far as a new headboard at this point, I’m torn between something DIY or buying something new. I’m open for suggestions on that! Wish me luck because this is one long list of to-dos! UPDATE: See the completed bedroom makeover here. I think this is going to be so great Roxanne! My bedroom is eggplant too! Maybe you’ll inspire me to get to work on mine ;). Haha, I really did love the color for a long time, but it’s time for an update! Excited to see this come together. Love the different textures that you’re pairing together. Thanks Lindsay, this room will be all about the textures! I totally love the eggplant color, haha! But I can understand being ready for a change! Your mood board is so pretty – I’m excited to see how you bring it to life! Thanks Emily, I will be a little sad to see the eggplant go but this room does need to be lightened up! This is going to be gorgeous! I love the eggplant, but I know what you mean about wanting to lighten up a bit. Can’t wait to see what you do in here! Bet your daughter is so excited about that inspiration room… it looks beautiful! Love the light fixture especially! I meant say inspiration board! Sorry! This is going to look awesome! Keeping my fingers crossed that the beautiful chair makes it in!!! Your plan looks so pretty! I love the idea for a green door. I can’t wait to follow along with you! I love the direction you are going in, but the eggplant is pretty too, and you certainly did do a wonderful job with that paint line. Lol. Looking forward to following along with your progress on this lovely room. My mom just did a deep purple in her bedroom, but it was only an accent wall so it doesn’t seem too dark. Totally understand the need for a change, though! 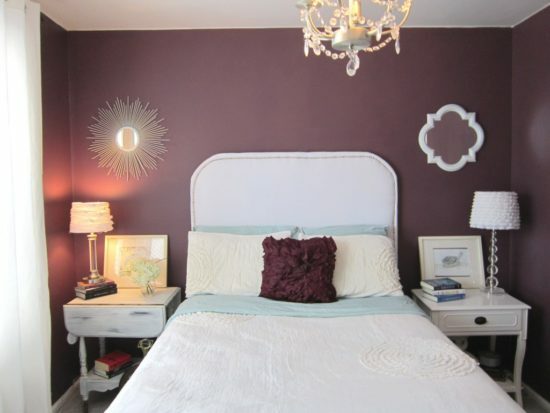 When I painted this room purple, it started out as an accent wall. We loved it so much I painted all the walls. It’s been several years, now we just need a change. Looks like it will be a lovely, calm room when you’re finished with it!